" PULITZER PRIZE " winning photo taken in 1994 during the Sudan famine. The picture depicts a famine stricken child crawling towards an United Nations food camp, located a kilometer away. The vulture is waiting for the child to die so that it can eat it. This picture shocked the whole world. 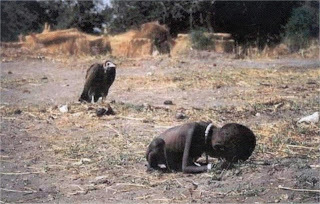 No one knows what happened to the child, including the photographer Kevin Carter who shooed the bird and ...left the place as soon as the photograph was taken. Three months later the photographer committed suicide due to depression.